A contest is going on in the Star Wars Old Republic forums. This contest covers all eight character classes. Submission for the contest can be in the form of audio, comic, written pieces. Along with each contests’ submission they need to provide some form of a sketch (it is not about quality). 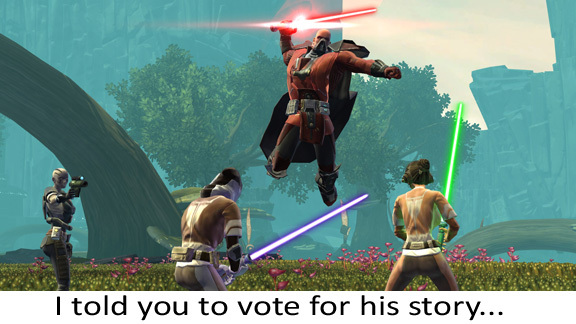 The contest is being put on by Kellmorn from, the Star Wars: The Old Republic forums. Each submission for a particular class can be found in the official Old Republic forums under Character classes. Look for links below, to find the exact link for the class of your main character. Submissions (audio, comic, written pieces) must provide a sketch (quality isn’t really an issue, it can be MS Paint and be awful) of the main characters weapon or gadget. This is so that a reward can be produced for them by Ironcleaver. He will be producing high quality 3D renders for all 8 winning submissions. The 3D images will be the main characters weapons or gadgets of the 8 class winner. It’s really quite a special prize, definitely something unique for all 8 winners. The grand winner of the competition will have their piece acted out and recorded in an audio-book format by The Followers of Palawa, they put on their well-received audio series. This is the opportunity for all you writers, and artists to create your own Old Republic based storyline. So hurry and get working on your ideas and look in the forums for Kellmorn’s posts to submit your contest entries. Best to all those who are looking to enter!